Jayalalithaa and Karunanidhi cannot forgive the Sri Lankan government and its Armed Forces for having vanquished their MENTOR Prabhakaran, whom they depended on so heavily to break away from India, and create a separate state of Tamil Nadu. This duo treated Prabhakaran with kid gloves, even though he killed thousands of Tamils during the war, and thousands of Tamils when they were fleeing from his clutches to the arms of the Government Forces, during the last days of the war. They conveniently shut their eyes to all the atrocities committed by Prabhakaran. The sinister motive of this duo should be clear to any intelligent Indian who loves his/her country. Led by C. N. Annadurai, the same game was played by the Tamil Nadu politicians in 1960s; using any provocation to break away from India. This treacherous conduct of the Tamil Nadu politicians compelled Jawaharlal Nehru, the revered and incorruptible Indian PM to enact the 16th Amendment to the Indian Constitution. It declared that politicians and others who directly or indirectly advocate breaking away from India and masterminding Separation would lose their seats in Parliament. Other provisions in the Indian legal system demand that such traitors be dealt with for HIGH TREASON which carry heavy penalties. The LTTE has been proscribed in India since May 1992, under the Unlawful Activities Prevention Act (1967), and therefore any person even remotely connected with any activity which borders on giving MATERIAL SUPPORT to the LTTE, can be dealt with under this Act. So, Manmohan Singh and Sonia Gandhi (if they have the interest of 1,200 million Indian people at heart) should take the bull by the horns and commence investigations regarding the unlawful activities of this duo, for inciting people in Tamil Nadu to resort to violence in the name of the (banned) LTTE cause. Each time the Sri Lankan issue comes up in Geneva, this duo pay some poverty-stricken folks to come onto the streets of Tamil Nadu and resort to violence. Some of these demonstrators don’t even know the reason for their campaign. Inciting people to create trouble is clearly an offence. Sonia and Singh should be concerned about the 1,200 million Indians, and not be terrorized by this duo. How can Mrs Gandhi and Dr Singh govern India if they are not astute enough to see through the crookish and sinister motives of this Tamil Nadu duo? Can’t they see that these Tamil Nadu politicians are endangering the stability and unity of India? If Gandhi and Singh do not take timely action and allow the Tamil Nadu matter to escalate, someday they will themselves be charged for Treason. These leaders are presently concerned only about staying in power, at whatever cost. They are not concerned with the security of India. In 2012, Hillary Clinton (the then US Secretary of State) visited only Tamil Nadu, during a visit to India! What is the secret pact she had with Jayalalithaa and Karunanidhi? What is this unholy alliance? Was the purpose of her visit (EXCLUSIVELY to Tamil Nadu), to encourage the politicians there to carry on a campaign (using the Sri Lankan issue as an excuse) which would culminate in Tamil Nadu breaking away from India? The US is interested in the fragmentation of India. Towards this end, they will supply weapons, money and such like. They see a united India as a nuclear threat to them. Through Gorbachev, they succeeded in breaking up the USSR. Now they consider themselves the only Superpower in the world. They see India and China as a threat to them. They want to remain the SOLE SUPERPOWER forever. Sonia and Dr. Singh want to stay in power by hook or by crook, even at the expense of eventually endangering the security of India. Only Dr. Subramaniam Swami, a former Indian Minister, is intelligent enough to see through this bogus campaign, of the duo in Tami Nadu. These two have no concern for the Tamils in Tamil Nadu, let alone the Tamils in Sri Lanka. Each of them is riding on the backs of the foolish Tamil Nadu people, to eventually become the Prime Minister of a SEPARATE NATION called Tamil Nadu. They are not satisfied with their present designation of Chief Minister of a State, belonging to India. 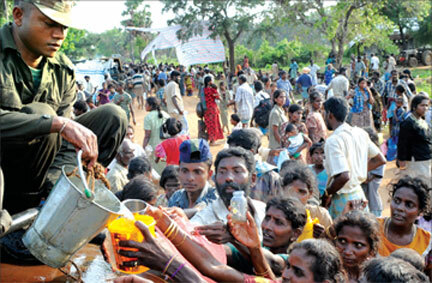 They proclaim that 50 million Tamils (in Tamil Nadu) are without a country of their own. They are having dreams of creating and heading a separate Tamil nation, where they can control the finances, receive aid in the form of weapons from the US and other Western countries, and the possibility of rubbing shoulders with world leaders. They regard the Sri Lankan crisis created and sustained by them, as a stepping stone to craftily creating a separate Tamil nation. For this purpose they exploit the unintelligent Tamils in Tamil Nadu and in Sri Lanka. In order to achieve their goal, they are pressurizing their Central Government to twist the arm of our President, to implement the 13th Amendment Plus. This is political dynamite, the implementation of which is hostile not only to Sri Lanka but to India as well. Giving Police and Land powers to the AGENTS of the LTTE DIASPORA will be the start of the “separate state campaign”. Incidentally, the 13th Amendment was foisted on Sri Lanka by India, by pressurizing President J R Jayewardene. Quoting Inderjit Badwhar, “ if countries use the bludgeon of the 13th Amendment to badger Sri Lanka to accept outside interference that hinders the peace, reconciliation and reconstruction process, Rajapaksa may publicly disown the 13th Amendment as blight on Sri Lanka’s newly found sovereignty following the defeat of the world’s most ruthless terror outfit”. Jayalalithaa and Karunanidhi, according to the findings of the Jain Commission, were very much in the know of the plan to kill Rajiv Gandhi in Siriperumdur in Tamil Nadu. It is SHOCKING that Rajiv’s Italian widow Sonia Gandhi, who has not only been left a political legacy, but also a sprawling house, enough money to live a comfortable life and enjoy worldwide social recognition (rather than being a nonentity in Italy) is not loyal enough to him, and is able to turn a blind eye to everything these Tamil Nadu politicians did to eliminate her husband, and in such a cruel manner as well. Where is her love and regard for her husband, who provided so much for her and her two children? She is prepared to yield to their threats and dance to the tune of the killers of her husband, merely to stay in power. If the Sonia-Manmohan Singh government collapses and a general election is precipitated, Karunanidhi will be in the political wilderness. Then all allegations against him and his daughter and his sons will be investigated with full vigour of the Law. Therefore it should be clear to the Sonia-Singh government that Karunanidhi will vote with the government, to prop it up from outside, for it will be political hara-kiri if the government falls. It is a tragedy that Sonia and Singh are not intelligent enough to realise this. Sonia and Singh will not be able to govern 1,200 million (1.2 billion) Indians, if their knees start to quiver each time the LTTE Diaspora or their Agents (the Tamil Nadu politicians) cough. Rahul Gandhi may lead the sinking ship, but unless he takes a firm stand against Jayalalithaa, Karunanidhi and the LTTE Diaspora, he will certainly not get an opportunity of governing 1,200 million Indians. If a miniscule section of one state (50 million people against 1,150 million others!) blackmails the Indian leaders of government, their agenda being the destabilizing of India, to achieve a separate nation, such government leaders are not fit to handle the security and well being of India. Winding up this essay with a word of advise to the Government of Sri Lanka: time is opportune for Sri Lanka to bring an Amendment to our Constitution to deprive any person contesting any election, from holding office, if it is proved that the candidate has advocated Separation at any time during hi/her political career. Advocating Separation either directly or indirectly, should also be considered HIGH TREASON, with stringent penal consequences. This is somewhat in line with the 16th Amendment to the Indian Constitution and the 6th Amendment to the Constitution of Sri Lanka Plus. The writer is a President’s Counsel and a former elected Secretary of the Bar Association of Sri Lanka.